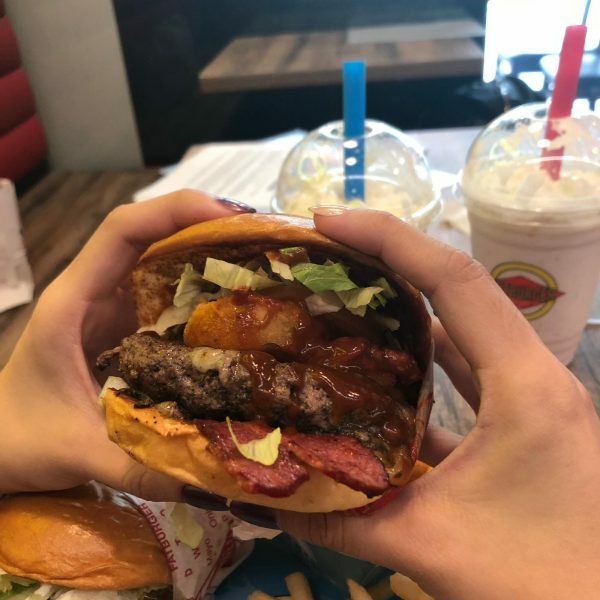 With its thick & juicy burgers, Fatburger truly does live up to its name. 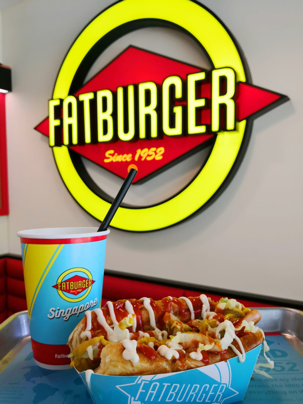 Fatburger — the famed burger chain hailing all the way from Los Angeles — serves up custom-made burgers, hand-scooped ice-cream milkshakes, classic American sides, and is now launching gourmet (and customisable) hotdogs! As huge burger fans, we were excited to try out the offerings at Fatburger, including their brand-new gourmet hotdogs. And they sure did not disappoint! The beef patties at Fatburger are made with 80% lean meat and 20% fat, chilled and not frozen, resulting in burgers that are wonderfully flavourful yet not dry. We tried the Original Fatburger (S$7.90), a single patty cheeseburger that comes heaped with onions, lettuce, tomato, relish, mayo and mustard before being sandwiched between fluffy brioche buns. We chose to add-on a fried egg for a dollar (delish!) 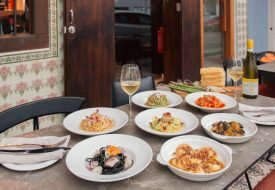 – take your pick from sliced cheese, fried egg, beef bacon, American-style chili or onion rings. You can even customise the burger buns: choose between brioche and wholemeal, while gluten-free buns are available at an additional S$2.90. The other burger we tried, the Western BBQ (S$9.90), was our favourite of the two. On top of the patty, the burger also came stacked high with beef bacon, lettuce, onion rings, and topped with generous lashings of barbecue sauce. It was difficult to believe that this burger was only one patty thick! For those tired of mediocre, overly-sweet barbecue sauce and over-cooked bacon: this burger is it, chief. We were in love with the fragrant and smokey barbecue sauce that held just the right balance of tang and sweetness, pairing well with the meat patty and buttery brioche buns. The sides at Fatburger fared quite well too: we loved the Homemade Onion Rings (S$5.90) and Skinny Fries (S$3.90)! The batter for the onion rings was surprisingly light and crisp, and did not get soggy even after 30 minutes! Not to mention, the onions were wonderfully sweet and juicy, the rings having a good ratio of onion to batter. The fries too, were deliciously fluffy – we could taste the potato within each fry, and couldn’t stop ourselves from having more and more! 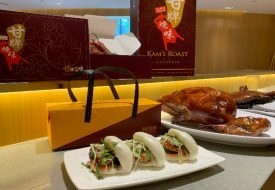 In addition to their lip-smacking burgers, Fatburger has also launched gourmet hotdogs which are just as customisable as their burgers. Out of the three new offerings – the Classic Hotdog (S$6.90), Chilli Hotdog (S$7.90) and the Chilli Cheese Hotdog (S$8.90) – we particularly liked the Classic Hotdog (pictured above). Topped with all the works of a classic cheeseburger (mayo, mustard, lettuce, tomatoes, pickles, onions and relish) on a delicious chicken sausage and freshly toasted brioche bun, it seemed the most simple of the three hotdogs. 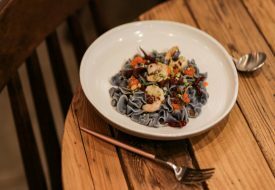 Yet, as the name suggests, it was definitely a classic, with the flavours of the toppings complementing each other, and the meatiness of the sausage. We especially loved the relish and pickles! 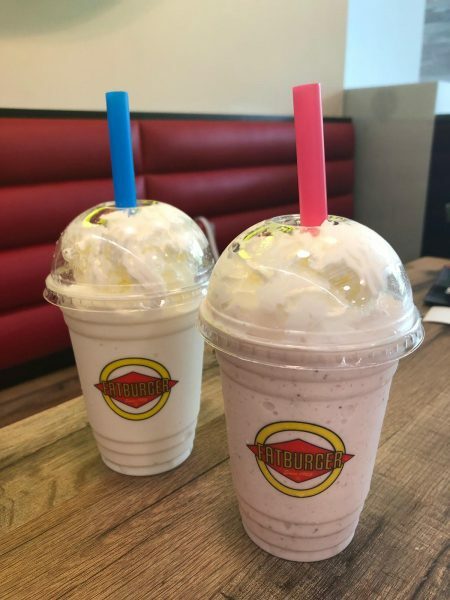 Perhaps our only quibble about Fatburger would be about their milkshakes. We tried the Strawberry Milkshake and Popcorn Milkshake (S$6.50 each). Fatburger’s milkshakes are special in that they are made with ice-cream, and not diluted in any way with water or ice. While we loved the delightful contrast of fresh strawberries blended in with the Strawberry Milkshake, the Popcorn Milkshake was a tad too sweet for our taste, and had only the barest hint of popcorn flavour. 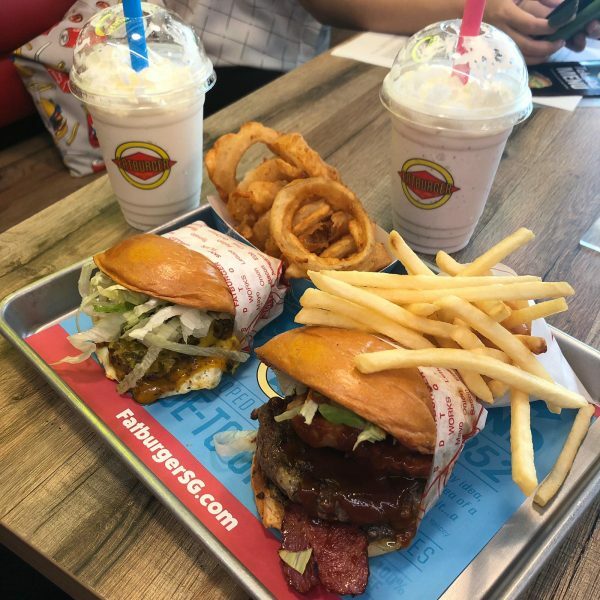 If American dining is your thing, and reading about Fatburger’s thick burgers and juicy hotdogs has your stomach rumbling, don’t hesitate to make your way down for a hearty meal now!